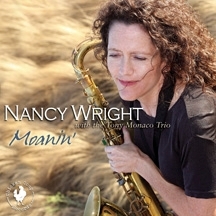 Well-established as a top Blues sax sideman for over 25 years, and well-known for her big tone and “grease”, Nancy Wright has recently stepped to the front of the band and into jazz territory with the release of her debut CD, “Moanin'” featuring a mix of soul jazz, blues, ballads, and boogaloo, including four original compositions. Like Texas Tenors Arnett Cobb and Illinois Jacquet, and Chicago “Tough Tenors” Gene Ammons and Sonny Stitt, today Wright works back and forth between blues and jazz comfortably. The organ combo setting allows her to naturally draw on her blues and R&B background, adding spice to the mix with New Orleans overtones. A refreshing new artist with that old/big tenor sound, Wright is brought into the spotlight by none other than “organ marvel” Tony Monaco and his original trio, reunited for the first time in years. West Coast, Ohio, New York, Philadelphia, Boston, Chicago, Washington D.C.